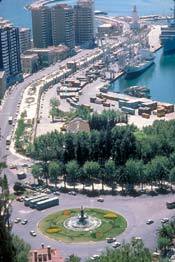 LEFT: Málaga's small harbor is in the city center, near sights and shopping. More than 350,000 passengers arrive in the Puerto de Málaga each year, primarily on ferries that serve the Spanish enclaves of Melilla and Cueta in North Africa. Cruising has also contributed to the growth of the port, however, with visits by nearly 250 ships and 50,000 cruise guests in 2002. Small and mid-size vessels like the Regatta can moor in the inner harbor, just across the street from Málaga's waterfront park and old town. A new Eastern Dock beyond the breakwater can accommodate larger ships, and a passenger terminal is in the works.